It’s taken me a little longer to write this than I had intended but March was incredibly hectic and most of April has been the same. Still, as the saying goes, ‘better late than never’ so now that I have a moment to think and type I want to write a little something about a fabulous gig I went along to in early March. I’d heard bits and pieces about The Bookshop Band – creative duo Beth Porter and Ben Please – over the past few years but I hadn’t had a chance to see them live. When the opportunity came up to see them in Stroud with my partner and two dear friends for a performance that fell on World Book Day, well, I couldn’t pass up that chance now, could I? Beth and Ben perform songs they have written which have been inspired by books they have read. The Bookshop Band started by being the musical entertainment at Mr B’s Emporium of Books in Bath when a writer was having a signing in the bookshop. The Bookshop Band, as Ben and Beth explained at the gig, would write a song during the signing and then perform it in the evening. As someone who (sporadically) writes songs myself, I can tell you that is a very impressive feat indeed! Not for the faint hearted! Having said “hello” to Ben and Beth as we arrived at the SVA’s John Street Cafe, we ensconced ourselves in some comfy chairs in front of the stage and read the fabulous handout detailing The Bookshop Band’s 9 albums that had been recorded in as many months! The Bookshop Band performing at SVA, Stroud, 2nd March 2017. One of the really lovely things about this gig was how intimate and friendly it was. Beth and Ben took time to explain a little bit about each book (without giving too much away) and what aspects of the book inspired the song they were going to perform. Their enthusiasm for reading and for the individual books was really lovely to see and utterly engaging. The songs themselves were fabulously performed; listening to wordy songs can sometimes be a bit tiring because of the concentration involved but in this case, the songs left the audience wanting to know more about the books in question; in one case, I ended up resolving to read the book purely on the effect the related song had on me. 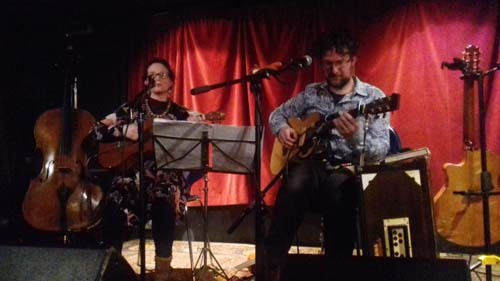 Between the two of them, Beth and Ben painted pictures of a host of narratives with their words and voices, and a clutch of instruments (‘cello, guitar, ukulele, harmonium – which had been loaned to them for the evening by a Stroud resident – and others besides). As well as being engaging and masterful songwriters, their playing was exquisite. The audience were not left to being passive receivers, either. One of the songs Ben and Beth had written was comprised of the first lines of a host of novels; the performers challenged their audience to identify the sources of those first lines. While I read a lot, perhaps I am not as well read as my companions for that evening as the only line I could identify for certain was from Peter Pan. Still, I was rather pleased with myself for spotting that one. While all the songs were fabulous and an utter joy to listen to, there were two that caused me to buy the CDs that featured them at the end of the evening. The first, from the album ‘That Ghost Belongs To Me,’ was a song based on ‘Thirteen Chairs’ by Dave Shelton. Now, I don’t tend to read horror because I can be prone to nightmares with that kind of stimulus but the description Beth gave of the novel and the song that it inspired absolutely gripped me so that ‘Thirteen Chairs’ is now definitely on my ‘To Read’ list. The other song that I fell in love with was ‘The Crowning,’ from their latest album ‘Before I Crack.’ This song was based on Shakespeare’s “Richard II”. It really captures the essence of Richard’s main soliloquies and, while it is not the most orchestrated track, it is utterly gripping in its simplicity. I have been known to listen to it on loop for hours – I can’t get enough of it. All in all, it was an utterly sublime gig and the perfect way to celebrate World Book Day. Keep an eye out for The Bookshop Band in the future (they are taking a wee break as Ben and Beth await the arrival of their baby) and if you get the chance to see them live then do so; you won’t be disappointed!